1; Students in Madison learn what it's like to be in space. 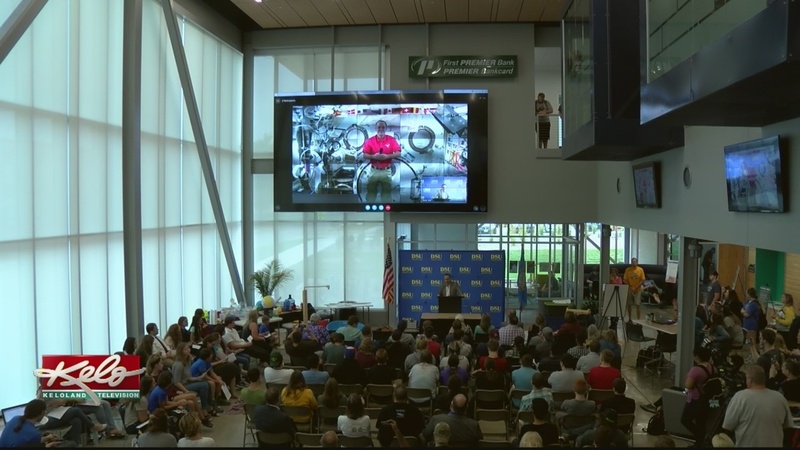 It's all part of Space Day 2018 at Dakota State University. It's not the typical morning for these middle school students and college students at the DSU. They had a conversation from outer space. "We need to ask him a few questions and see what he has to answer and a little bit about space and what they are learning out there," said Cade Minnaert. Ricky R. Arnold II. Is an astronaut on the International Space Station. On Monday he shared what it's like to be in space. "I will be in space for 197 days, for just over half a year, most of us will train two to two and a half years for a half year mission to the ISS," Astronaut at the International Space Station, said Ricky R. Arnold II. "Just a great opportunity, we are really pleased that our faculty has been working hard to put together this day and provide the activities for everyone to enjoy," said Jose-Marie Griffiths, President the Dakota State University. Arnold recounted his experiences more than 200 miles above the earth.